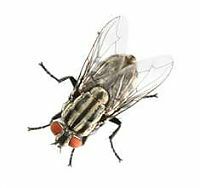 The House Fly is usually a problem associated with restaurants and is probably the most common pest of all time. Females will lay up to 150 eggs in a batch with up to 5-10 batches spaced several days apart. She’ll deposit these eggs into anything organic, including garbage, compost, pet and animal rest areas, kitchens, dumpsters, or anything else left in the open that is decaying. They’ll produce up to 20 generations in any one summer. The adults live for about a month and do nothing but reproduce and bother people. 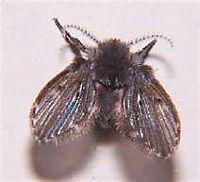 Other fly problems may involve Cluster flies, Moth or Drain flies, Phorid flies, Fruit flies, and others (see pics below). Fly control is not an exact science and will always be an ongoing battle from year to year. It often involves experimentation at times to find the right approach to a particular problem. Since they have wings, this is an insect that can go virtually anywhere. Our fly program will significantly reduce your fly problems through a carefully orchestrated plan that involves surface spraying, light traps, and bait. 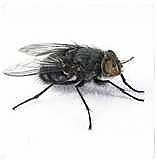 We’ll also work with you in identifying the possible source of your fly problems and any possible areas of entry, along with any possible correction & prevention techniques. 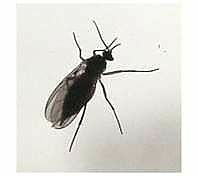 Black Flies are most common in our areas around our East Texas lakes because they develop in clear running water. The adults live for about 2-3 weeks and bite during the middle of the day, often swarming around the face in a thick swarm. Females feed on blood and males feed on nectar. Females deposit from 150-500 eggs in submerged vegetation and the eggs hatch every 4-5 days. At this rate, one can see how they get out of control in such a short amount of time. Reduce moisture-laden areas inside kitchens and bathrooms such as sponges, rags or other linens, etc. These are used by many species to lay eggs on.